The morning wore on as I puttered around the house gathering hiking gear. Andrew, my steady hiking partner since returning from studying abroad, lie asleep in bed after driving nearly seven hundred miles the day before. 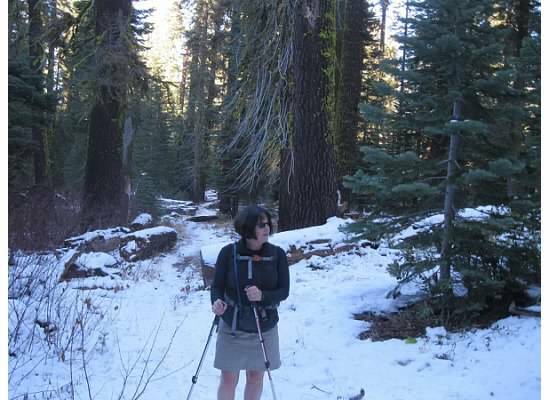 I hemmed and hawed, unsure of whether to hike alone or stay home. 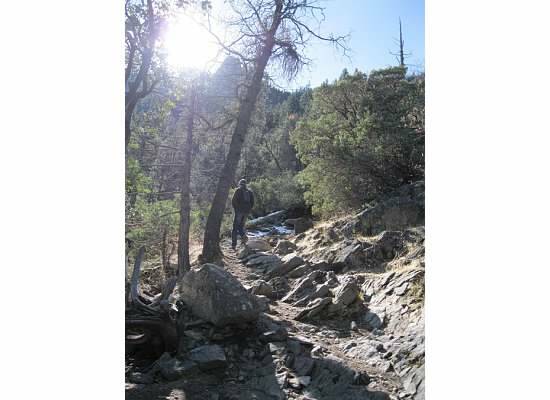 My plan was to walk the Pohono Trail to Crocker Point. 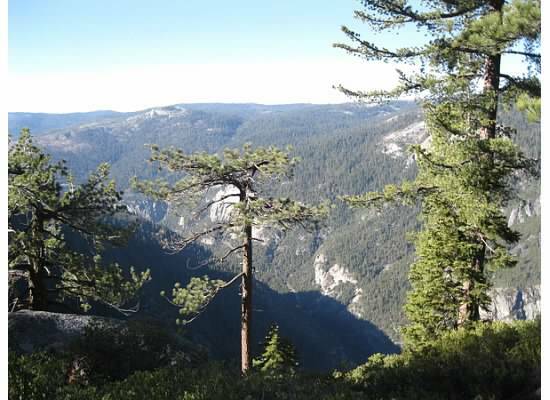 I have hiked various portions of the thirteen mile trail throughout the years: Dewey Point, Taft Point, the Pohono Loop to Sentinel Dome, and Inspiration Point, but always fell short of reaching Crocker Point. Andrew as Atlas. January 2012. Then the phone rang—it was my neighbor asking to borrow a hiking book. 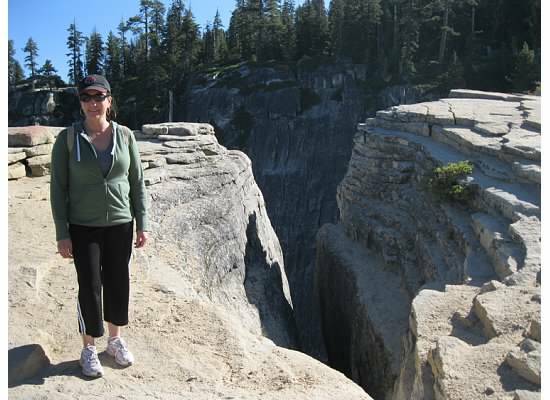 Her family was visiting from Orange County, California and wanted to hike in Yosemite while they were here. I mentioned to her that I was getting ready to go hiking myself and wondered if any of them would like to join me. She graciously declined, then phoned back minutes later saying, yes. 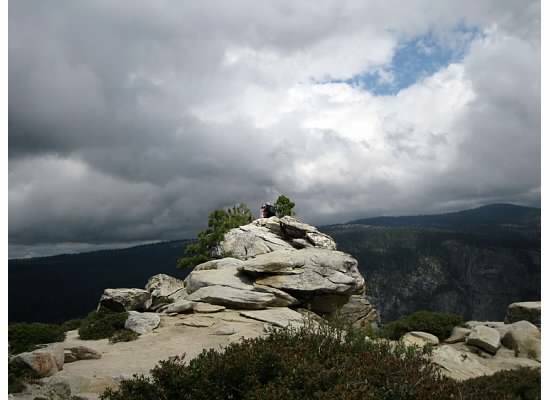 Taft Point and the Fissures with my sister. September 2010. That was the push I needed to get going. I quickly stuffed a lunch into my pack and headed out. My hiking partner for the day was her sixteen year old grandson, Jonathan. This was my first time meeting him (and his parents) although I had heard many great things about them. He was game to go with me even though my sleepy-head son stayed home. 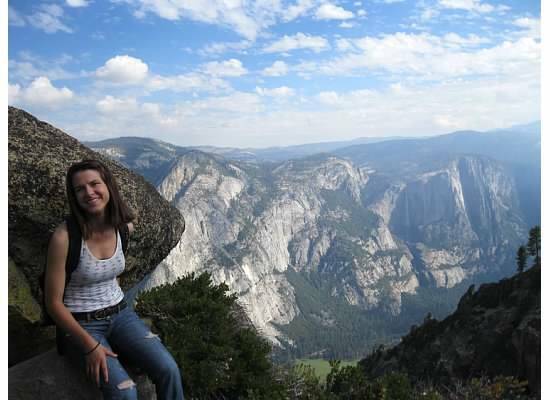 The Pohono Loop to Sentinel Dome with Julia. July 2010. 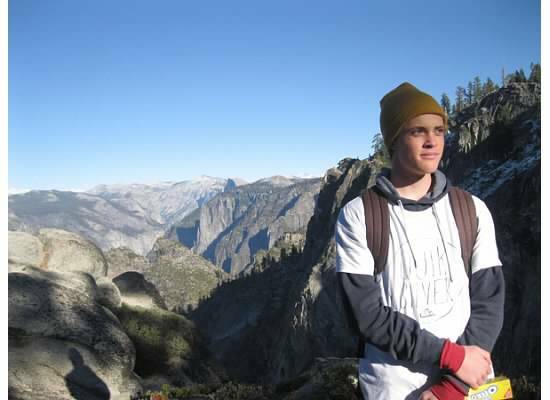 Jonathan, a high school sophomore, enjoys hiking. 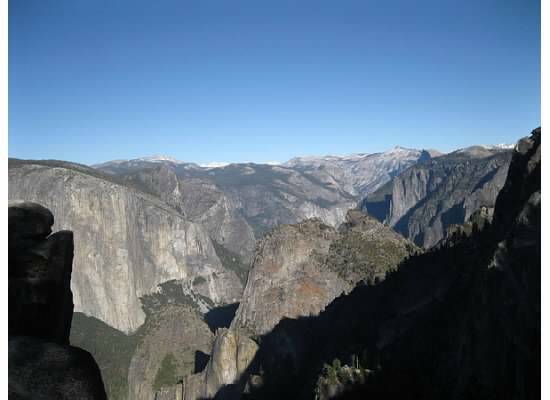 He and his dad hiked to Nevada Fall a couple of years ago. That, coupled with the fact that he is athletic (on the school track team and surf team) gave me confidence that he would do well on the strenuous trail. We began the hike at Tunnel View where you don’t even need to leave your car to see a panoramic view of the glacier-cut valley. View from the Tunnel View scenic view parking lot. 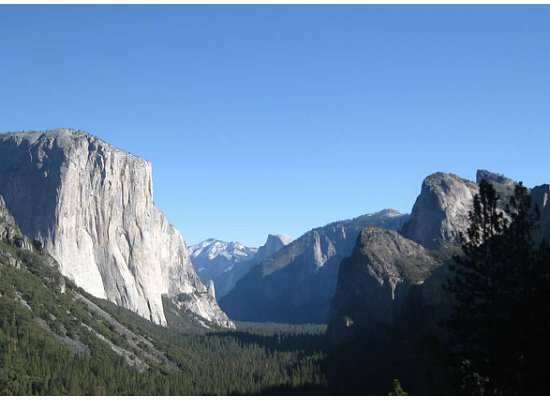 From Tunnel View, the rocky trail climbed around switchbacks. The cacophony of squealing breaks, humming tour busses, and slamming car doors faded away as we walked deeper into the wilderness. A rocky section of trail. January 2012. 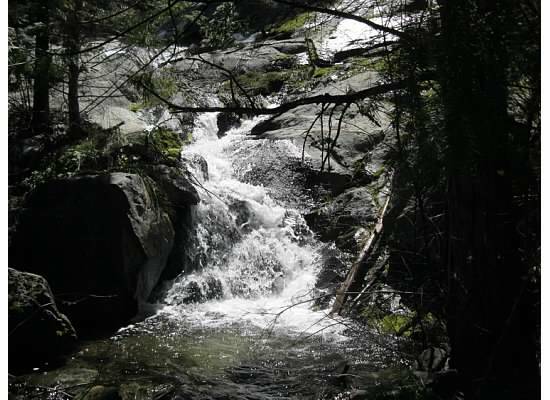 In May 2011, Wendy and I carefully stepped from stone to stone trying to keep dry while crossing Meadow Creek. Jonathan and I crossed the creek as well, but the water was only an icy trickle, too small to form Silver Strand Falls that is sometimes visible from Tunnel View. We paused at Artist Point, which is not an actual point, but a place on the trail with a great view. View from Artist Point. 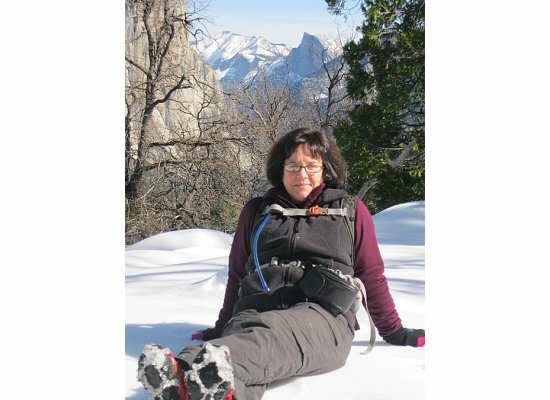 Notice Bridalveil Fall in the background. May 2011. Continuing uphill, we reached Inspiration Point where back in January 2012, Andrew and I had hiked through snow. This time Inspiration Point was dry. View from Inspiration Point, January 2012. Jonathan noticed the changes in the trail as we gained elevation from the lower zone of mountain chapparal to the upper zone of lodgepole pine and red fir trees. 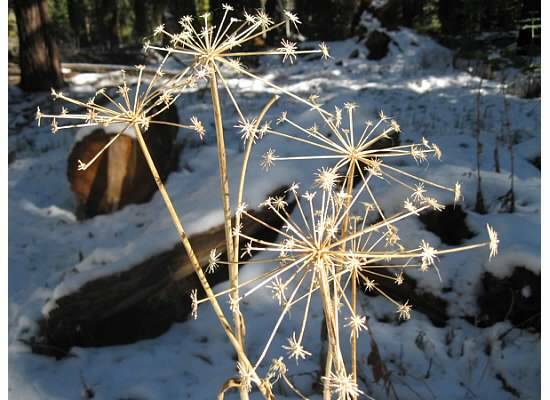 The forest floor was littered with fall’s brown leaves then frost, ice, and snow. Leaves on the trail at the lower elevation of 5,300 feet. Birds bantered back and forth and grey squirrels foraged. Two hikers came from behind, passed us and we never saw them again. The trail climbed through the forest. 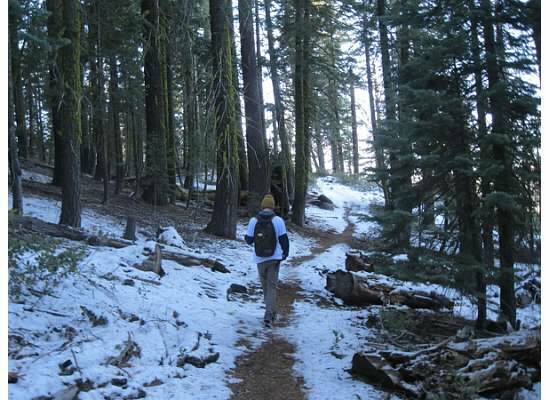 The trail became frosty in the open areas and our hands and cheeks were numb from the cold. The higher we walked, the closer we came to the snow line. Our next stop would be Stanford Point. A spur trail led us to the less spectacular view. Looking down at the pine-clothed hills from Stanford Point. The snow deepened as we continued from Stanford Point to Crocker Point. 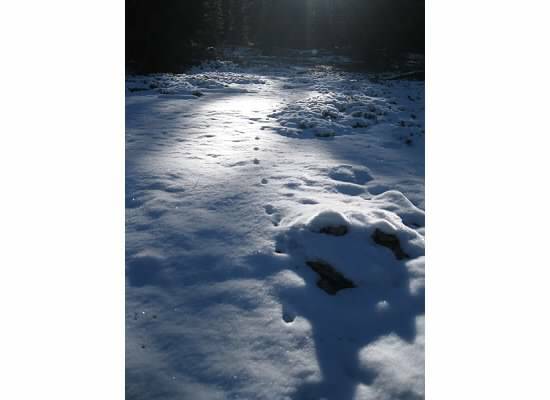 Animal prints in the snow. 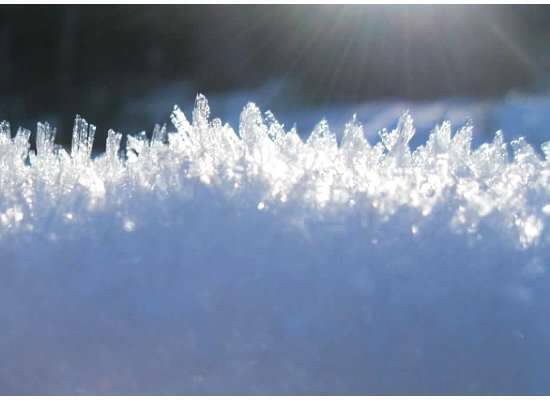 Intricate blades of ice glistened in the sun. Although there were no flowers on the trail, there was beauty in what was left behind. The approach to Crocker Point was sunny and void of snow. We stood facing the sun hoping to capture the warmth from its rays. When we left the car, it was a brisk thirty-four degrees. The two thousand seven hundred foot climb caused us to sweat, but didn’t warm us. The last climb up to Crocker Point. Elevation 7,090 feet. The view at the top was breath-taking. A sea of granite opened up before us. It took three hours to reach Crocker Point. While eating lunch, we walked around admiring the rust-stained shapes in the mass before us. 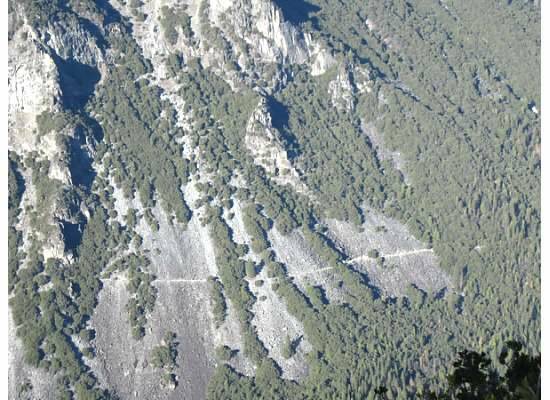 Looking down, I could clearly see Old Big Oak Flat Road (the Rockslides Trail) that I had been trying to find on the last day of summer. 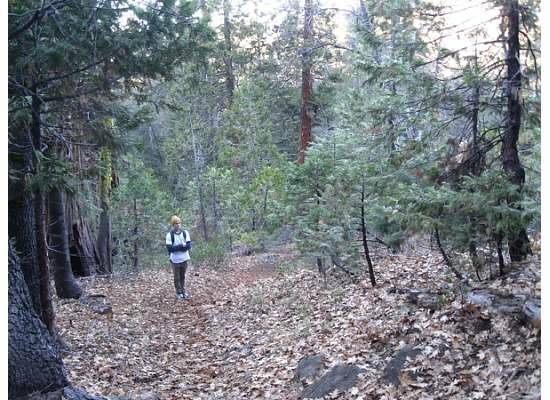 Old Big Oak Flat Road trail. We stayed only a short time at Crocker Point before returning downhill at a break-neck speed, through the snow, passed Stanford, Inspiration and Artist Points, over the rocks and down the last granite steps of the day as the sun sunk low in the sky. We sped downhill so fast it felt as though I wore skies. Jonathan’s words when we reached the car, “It feels good to sit down.” It certainly did! I thank Jonathan for coming with me even though it may have been awkward to do so. 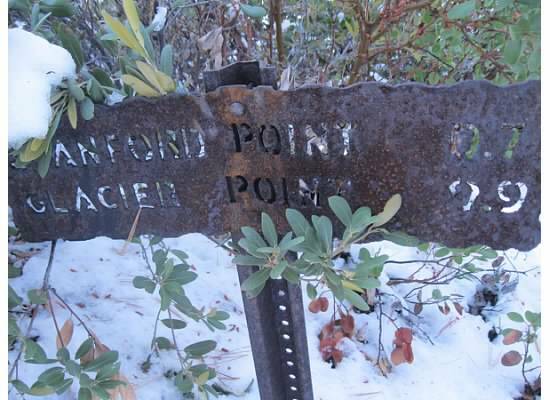 Without a partner, I would have turned around at the snow line and would not have reached Crocker Point. 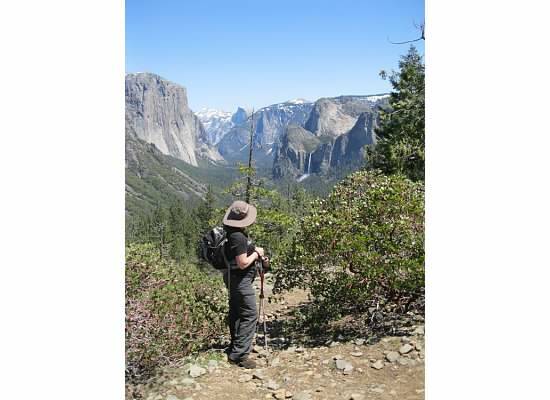 This entry was posted in Yosemite Hikes and tagged Artist Point, Crocker Point, Dewey Point, Hiking, Inspiration Point, Pohono Trail, Stanford Point, Taft Point, Tunnel View, Yosemite, Yosemite National Park on November 30, 2013 by Janet. I loved reading about your adventure. Jonathan had an amazing day. Thanks for letting him join you. He would never have been able to have that experience with the rest of the family (the 9 year old would not have made it that far). 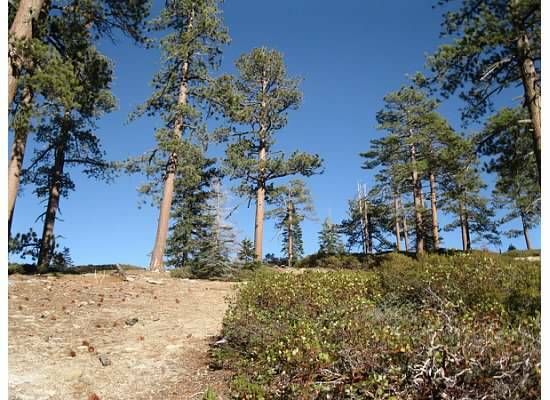 We enjoyed visiting the Sequoias as a family on Wednesday. Beautiful! You’re welcome, Denise. It’s always a pleasure for me to play unofficial tour guide. 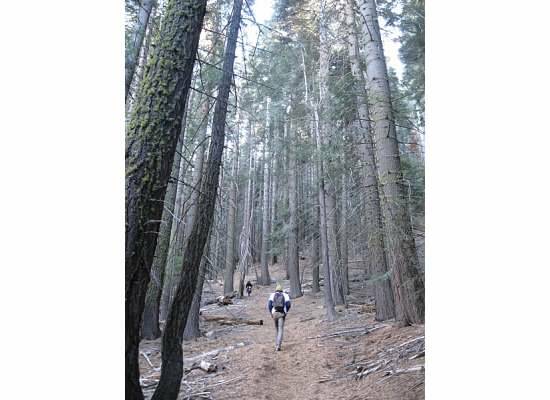 🙂 Mariposa Grove is a really good place for families to hike and see some awesome sights. The trees are amazing there. Have a peaceful holiday season. As always, great pictures with descriptive narration. I, too, am glad that Jonathan joined you so you were encouraged to continue it all the way to Crocker Point. 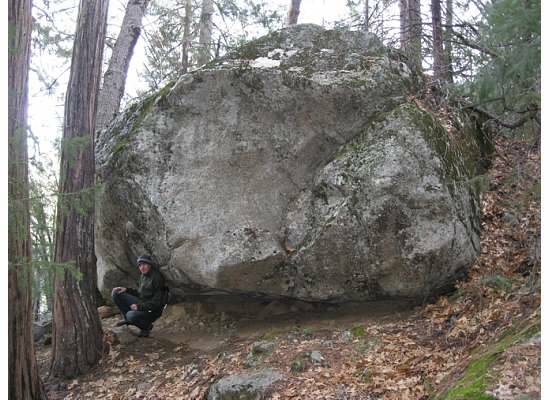 Enjoyed reading your latest hike, Janet. How nice to have Jonathan for a hiking companion. I always get an extra-special kick out of reading the comments of your dad. So sweet. Yes there is, Oliver. Thanks for stopping by to read. Thank you, Oliver, for stopping by and commenting. Happy trails.